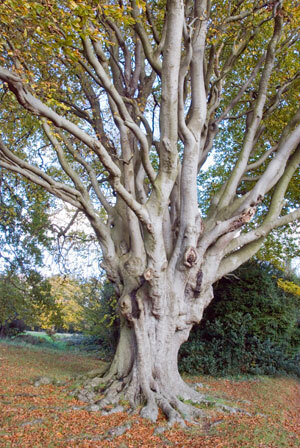 Beech may grow to form beautiful, stately trees (up to 30 or 40M high); the trunk may be massive. It is a relatively fast growing species, that is to be found on well drained soils. Its root system is relatively shallow, and the tree is, therefore, susceptible to high winds and also drought. In some parts of the country, beech has been extensively used in hedge laying. It is important to check to check for rot where the crown forks (in larger trees). Simple leaves that are longer than they are wide (pointed ovals). They have between 5 and 9 pairs of veins. At the end of each vein, there is a small tooth on the wavy leaf margin. Young leaves have an almost corrugated or ribbed appearance - see photo. 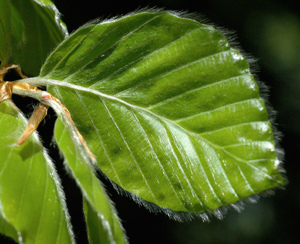 The leaves are arranged alternately along the twigs. When the leaves are first formed, they are a light green colour but gradually darken. 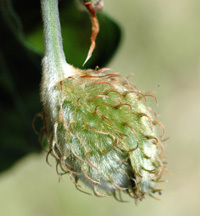 When first formed, there are small hairs on the margin and underside of the leaf but these are lost as the leaf matures. 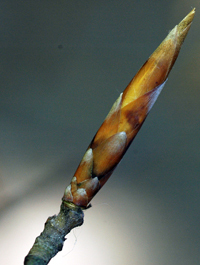 Long pointed buds, set at an angle from the twig/stem. Quite long (and big in relation to the stem/twig), sometimes described as copper coloured, & cigar shaped. 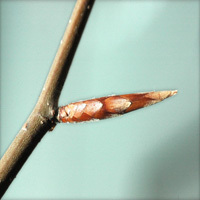 Young twigs have a slight zig-zag appearance. The twigs may retain dead leaves throughout winter (which makes beech good for hedging). Beeches have a smooth grey bark; some develop criss-crossing ridges with age. Yellowish-green small flowers which appear as the leaves unfurl from the buds. The fruit that forms from them is ‘beechmast’. This consists of green prickly husks that contain shiny brown nuts. As the husk dries, it splits releasing the nuts. The seeds / nuts constitute what is sometimes termed the mast, and the number produced varies tremendously from year to year. Those years when the production is prolific are termed Mast Years. The leaves wither in the Autumn but may remain on the tree throughout the winter - especially on hedging or younger trees. This 'phenomenon' of retaining the leaves in the winter months is known as marcescence.